J-Q.com features tech news and analysis based on over two decades of JQ's reporting for The New York Times, PC Magazine, CBS News, and others. You'll find everything here ranging from television news reports to Web site reviews. To keep up with the latest news subscribe to the newsletter or visit JQ's Blog. Spring in New York is the time when the major television manufacturers take their last shot at impressing reviewers and critics with the latest TVs the companies plan to debut in late summer and early fall. In the last couple of weeks, I’ve squinted at new monitors from Westinghouse, Panasonic, Pioneer, and this week, Mitsubishi. So what is likely to be the next set you’ll buy? Westinghouse has made a name for itself—or rather re-introduced the name for itself—by offering relatively inexpensive but solidly built LCD-based, high-definition TVs. And it continues to apply price pressure on all the other companies. Within a few months it will offer, for example, a very sharp and very bright 52-inch LCD set, the TX-52F480S, for just $2,400 (list). That price may still sound high, but it will strike fear into the hearts of companies like Sony and Sharp; and it represents a good value (if you happen to have the money to spare). At the other end of the scale, Pioneer continues to push the technical envelope in plasma HDTV sets. The company has improved the resolution—pushing it up to 1080p in some sets—and black levels and color fidelity of its models. However, Pioneer sets are still for the well-heeled, with the high-end HDTV 50-inch plasma models coming in at around $5,000 (now the Westinghouse model sounds cheap, doesn’t it?). Meanwhile, Mitsubishi—once the king of large, traditional CRT sets—has moved from emphasizing rear-projection DLP-based TVs to underscoring its fleet of impressive flat-panel LCD monitors. On the DLP side, new features in some models will include a special 3-D gaming mode for connected computer games (yes, you’ll have to wear silly glasses). The effect is a little gimmicky, but gamers will appreciate it. More impressive are Mitsubishi’s top-of-the-line LCD displays, which feature not only the hallmark of LCD sets—superior brightness—but also better motion and improved performance in dimly lit movie sequences (a.k.a., contrast ratios). The last two items are thanks to 120Hz image processing (which is twice the rate of standard 60Hz LCD sets) and dynamically adjusted brightness, which changes depending on the scene. Mitsubishi isn’t likely to threaten bargain builders, but its 144 Series 46-inch LCD monitor will list for just $3,899—and it delivers a stunning picture. So what should shoppers look for this fall? Lower prices again, of course, with many of the numbers I’ve quoted falling further still. 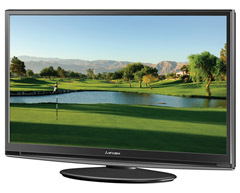 For what Panasonic is pushing, and for advice on how to choose between the competing HDTV technologies, see below. Are LCD Sets the Future? Recently, Panasonic held its annual line show for members of the press to give us an early view of televisions and video equipment coming out this fall. While high-definition TV was the major theme of the show, Panasonic continued to underscore its view that flat panel plasma displays are the future. Indeed, the company is betting heavily on it, building state-of-the-art factories. Panasonic hopes to produce nearly 11.5 million plasma sets next year. While Panasonic’s robots noiselessly press more and more panels each day, competing technologies, such as LCD and DLP continue to improve—and lower their prices. I believe LCD sets will ultimately replace conventional TVs in most American homes, but the question is, what should you buy now? LCD: Liquid crystal displays are flat panel sets based on the same technology used in laptop displays. This technology offers some of the brightest pictures, making them great for brightly lit rooms. The drawbacks: poor contrast ratios mean that it’s difficult to see details in dark scenes in movies; some models have trouble reproducing green. Plasma: Flat-panel plasma sets offer good color reproduction and wide viewing angles, making them a great choice for movie watching in normal or dimly lit rooms. The drawbacks: Images can look soft, most cannot do full 1080p resolution, and brightness is an issue. DLP: Rear-projection DLP sets offer excellent contrast ratios, a pixel-free, cinema-like picture, and are relatively inexpensive, especially in screen sizes above 50-inches. The downside: some people see occasional “rainbow effect” artifacts and projection set bulbs need to be replaced every few years. Technology and in particular personal computers have had such an impact on our business lives that we often fail to notice their effects today. But finding and using the right technology for the task at hand is still a challenging process. In this section you'll find a variety of JQ's articles aimed at helping business owners, large and small. Booster Shot: Cuts communication costs while improving flexibility and adding services. Most businesses have heard of voice over IP or VoIP phone service and its benefits. But according to a survey by technology consultants at Savatar only about 17 percent of SMBs have made the switch. Why? Because most Internet phone services don’t offer communications packages designed for small businesses. Now that’s changing with a variety of tiered services that can fit nearly any business model.